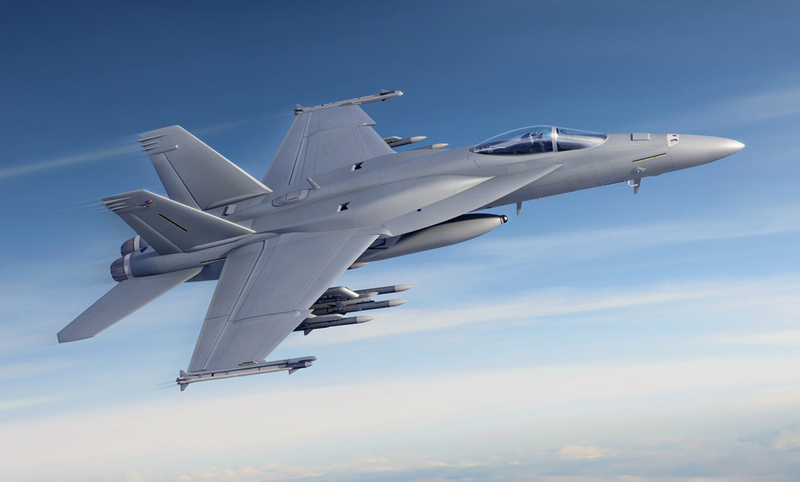 Boeing has received a three-year contract to supply 78 Block III Super Hornets (61 F/A-18Es and 17 F/A-18Fs) to the U.S. Navy. Announced on March 20, the deal is worth around $4 billion. Adopting a multi-year procurement (MYP) process achieves significant savings, estimated at more than $395 million for this deal. Six of the aircraft are funded within the FY18 budget, with the remainder spread across FY19-21. There is scope within the yet-to-be-approved FY20 and FY21 budgets to add six more aircraft each year at the same reduced cost through a variation in quantity clause. Block III aircraft represent a major improvement on the existing Block II Super Hornets. They will have significantly enhanced networking capability and communications, advanced cockpit, and conformal fuel tanks for extra range. Airframe life is increased from 6,000 to 10,000 hours. New-build Block IIIs covered by the MYP are scheduled for delivery by 2024. In the meantime, Boeing expects to begin upgrading Block IIs to the new standard “early in the next decade”. The Department of the Navy recently released its FY20 budgetary request, which included 24 Super Hornets, with a similar number planned for the subsequent two years, after which the annual procurement rate drops to 12. Also included in the FY20 request are 30 Lockheed Martin F-35s, split equally into batches of 10 F-35Bs for the Marine Corps, and 10 each of the F-35C for the Marine Corps and the Navy. The request also includes funding for the first 32 helicopters that will replace the Bell TH-57 SeaRanger, along with four Northrop Grumman E-2D Hawkeyes, six Boeing P-8A Poseidons, and three Lockheed Martin KC-130J Hercules. Two more Northrop Grumman MQ-4C Tritons are included, along with the first three of a planned six General Atomics MQ-9A Reapers, which are being procured primarily for training. The budget includes funding for the next Ford-class aircraft carrier, CVN 81, and the RCOH (refueling and complex overhaul) of USS John C. Stennis. However, the Navy’s plans also include the early retirement of USS Harry S. Truman rather than put it through the costly RCOH process that was scheduled for 2024. Perhaps the most interesting aviation item in the FY20 request is that for 22 Northrop F-5E/F Tiger II aircraft, to be divided equally between the Navy and Marine Corps. These aircraft will be acquired to improve and expand the adversary fleets of both services. The Navy bought 44 F-5E/Fs from Switzerland in the 2000s, refurbishing them as F-5Ns. The new batch of 22 is also coming from Switzerland, and the aircraft are due for refurbishment by Northrop Grumman at its St Augustine, Florida, facility. The value of this requested purchase is just under $40 million for all 22 aircraft and spares.